A quick note to give an update on the project. Thanks to your help we’re out of images on Comet Hunters. By completing the active images on the site, the project has searched the last big batch of data from our Suprime Cam search. This set of images nearly completes our current Archival Suprime Cam search. We have some partial or incomplete downloads to upload, and those images will need review on the site. I’m aiming to get these images uploaded in the next few weeks. I’ll keep you posted. With this set of images, the science team can focus on reviewing the candidate comets (based on your classifications) and estimating what is the activity rate in the main belt of the asteroid belt. We’ll keep you posted on the science team’s progress. We’re still having some processing issues with the HSC imagery. I hope we’ll have new images for that search soon, but in the meantime thank you for all the time and effort you’ve put into Comet Hunters. From all of us on the science team, we really appreciate it. 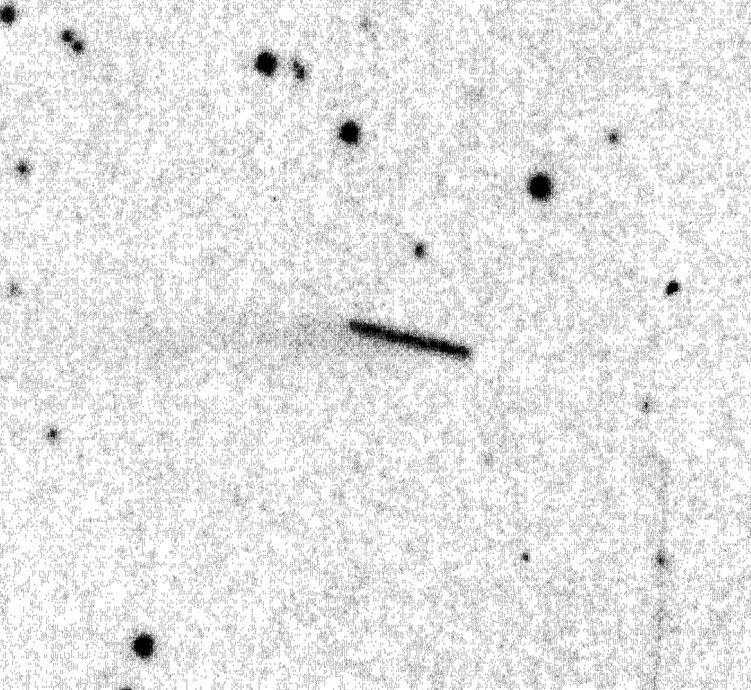 One of the main ideas of Comet Hunters is to see what activity in the asteroid belt looks like on a whole when we have the sensitivity of a 8-m class telescope. The Large Synoptic Survey Telescope (LSST) expected to start full science operations in 2022 will be surveying the sky nightly providing a new inventory of the Solar System. Michael Knight,a research scientist at the University of Maryland, has written a nicely blog post talking about cometary activity in the era of LSST. You can read it here. I know it’s been a long time since we’ve posted on the blog. As most astronomers and planetary scientists, the science team is juggling multiple projects and other support and service duties. It’s a new year, and some of us have have more time to devote back to Comet Hunters. Many thanks to our Talk moderators who have been pointing out are tirelessly pointing out questions and helping out with new members of the Comet Hunters community. We’ve still been having issues getting new HSC subject images ready for the site, for now I’ve paused that workflow to focus on the Archival search, which is planned to be the project’s first paper. Thanks to your help we’ve moved through of the search, and we’ve uploaded the new batch of images. This set will basically finish off our sample of asteroids we wanted to search for the first paper. That’s why we decided to focus on this right now, rather than the HSC search. This batch of Archival images includes some of the asteroids observed at launch but has improved positional accuracy and has sources identified in the images that were popping up as blank. It will important to have these classifications so that all the asteroid observations were produced the same way . Thanks for your help with Comet Hunters. More news soon. No Halleymites in the Main Belt! Today we have a guest post by Comet Hunters volunteer Peter Jalowiczor. How prophetic. I certainly have never heard of them. At the time Comet Halley came around in 1986, I was a first year Physics Student at the University of Sheffield. This astronomical event was big news. A few years later, I would engage in a slice of Postgraduate research for P/ Halley under one of the academic staff who was a World expert in his field at the time. Over thirty years later and we have Comet Hunters; it is a project I have contributed towards alongside other Zooniverse projects (mainly P4). By classifying images whenever there were a few minutes. 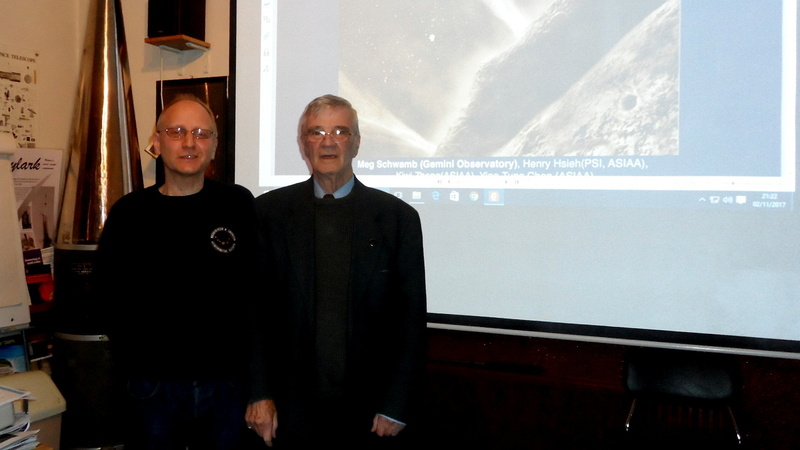 Recently, I had the opportunity of collating materials from Comet Hunters for a talk to be given at my local Astronomical Society: the MSAS (the Mexborough and Swinton Astronomical Society). The society is situated ~20km from Sheffield (pop, 570,000), England and was founded in 1978. Every Thursday evening is a social occasion centred on a lecture. Members, such as me are encouraged to give talks. 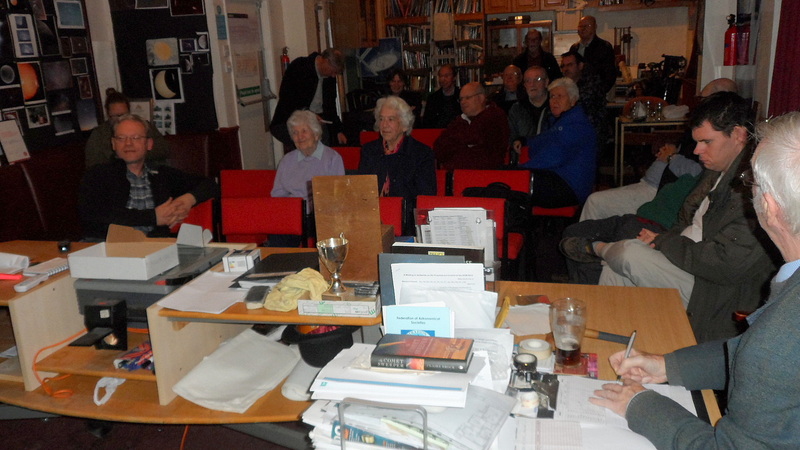 Usually about once a month, an academic visits the society to present on an aspect of Astronomy. Started with an introduction to Comet Hunters as a citizen science project. The project was initiated to greatly increase the discovery rate of these objects. The first such object was found in 2006 and there are only 12 known at present. This followed with a discussion about Asteroids and Comets with the distinct examples of Gaspra and Halley being given in these categories. However, where do we draw the distinction between these objects? Comets were always assumed to have come from the outer Solar System beyond the orbit of Neptune. Asteroids have generally thought to be from the Main Belt. Next came a discussion of the two different searches: the HSC Survey or the Archival Data Search. A discussion of the instruments: Suprime Cam and the Hyper Suprime-Cam used in the search for these objects. The Subaru telescope – this also included Meg’s detailed description about life for Astronomers at this wonderful observatory; one of the best observing sites in the World. The difficulties experienced by Astronomers at such high altitudes over 4,600m asl. Anyone working at the summit of Mauna Kea cannot stay up longer there longer than 14 hours needing to descend to mid-altitude for safety and health reasons. Sandwiches left for more than 20 minutes become stale giving all the water to the air (as the one left by Meg). This prompted one of the members to jokingly suggest Rhyita might be a better option next time. Another of the society members (not present) has travelled the world specifically visiting observatories and had the privilege of visiting the observatory in 2012 at the time of the transit of Venus. Hyper Suprime-Cam search launched in June 2016. 0ver 8,000 volunteers have contributed to the project to varying degrees, inspecting HSC for main belt comets. 4,877 main belt asteroids located in the HSC wide survey fields have been searched for cometary activity. Assuming a detection efficiency of 20% an upper limit of 1% is placed for the occurrence rate of MBCs in each of the sample of asteroids. Simulated MBC observations are planned to measure the detection efficiency. A variety of questions were asked following the two presentations. The Comet Hunters science team will try and answer these questions in a following blog post. Snow Line – how exactly is the boundary of the snow-line worked out? What is its relevance? It seems that there is water (albeit in different forms) such as lots here on the Earth both inside and outside the snowline? Regarding the MBCs isn’t there a possibility that the surface ices over geological time would have sublimated from the outside (of the object)? We would then be left with ice at the centre perhaps covered with rock/dust? Classification: What is the point of the reference images: the ones to the right of the main image when we are really looking at the central object? What is the file size from the updated camera (i.e. Hyper Suprime-Cam)? In the charts showing the ‘Tail Visible in One of the Images’ and ‘Tail Visible in Two of the Images’ what exactly does this data represent? The presentations certainly opened up some debate during and after the talks. A number of members noted that if we look at the current definition of Comets and Asteroids, there does not seem to be a clear boundary. How would Enceladus fit in this category? After all, it is ejecting water. We have new HSC images available on Comet Hunters from last August now available now on the site. With more asteroids, there are more chances to identify cometary activity. If you don’t spot a tail, that’s okay too. You’re helping us figure out how frequent these cometary outbursts are. Also today, the Hyper Suprime-Cam Survey, which we get our asteroid images from, just had their first public data release. You can read more about it, and see some stunning images from the HSC camera here. HSC Search: Thanks to your help, we’ve completed all the live HSC images. We’re currently working on processing more images. We had some data processing challenges that are not solved. We hope to get new images on site by the end of February. Stay tuned for to this space for more updates. Because of the longer exposure times used by the Hyper Suprime-Cam survey, the asteroids look bean-shaped or elongated in the HSC search. This trailing is due to the asteroid’s relative motion to the Earth. We’re seeing it move and therefore its light is deposited in slightly different positions along the camera’s field-of-view during the exposure, creating a streak or trail. As far as we can find in the scientific literature, nearly all main-belt comets were detected in images will little trailing. We found one example, that we wanted to share with you. Below is a well-known image of Main Belt Comet 107P/Wilson-Harrington. This observation was actually taken back in 1949 (on glass plates!) by the 48-inch Oschin Schmidt telescope on Mt. Palomar for use in the Palomar Observatory Sky Survey (Fun Fact – I used the same telescope for my thesis survey for distant Kuiper belt objects nearly 60 years later). Yanga Fernandez, Lucy McFadden, Carey Lisse, Eleanor Helin, and Alan Chamberlin went back to these observations in 1996/1997 and found that this asteroid was active as an MBC with a visible tail! You can find their paper here (unfortunately it’s behind a paywall, but you can read the paper abstract for free). The asteroid is very streaked, a bit more than what you typically see on the Comet Hunters HSC search, but it gives you an idea. The tail is faint and diffuse, but visible off to the left of the streak. In case you need help spotting the tail, I’ve annotated this version below with magenta arrows pointing to the tail. Adapted from DSS/ Fernandez et al., 1997, Icarus, Vol. 128, pg. 114-126. Magenta arrows indicate the faint tail. I wrote this sitting on a plane on the way to Grapevine, Texas. I’m on my way to the American Astronomical Society winter meeting. It is the largest meeting of astronomers in the United States. I’ll be presenting a talk on Comet Hunters about the Hyper Suprime-Cam search. A question that pops up from time to time on Comet Hunters Talk is whether or not we can see the shape of an asteroid in the HSC and Suprime-Cam observations. The answer to that is no. The Subaru Telescope does not have the resolution to resolve the shape of the asteroid. The asteroid is viewed by the telescopes and cameras as point-like and smeared out to the turbulence in the atmosphere and the optics of the cameras just like the background stars, so we can’t infer anything about the shape of the asteroid in most case just from what we see in the Comet Hunters images displayed on the site. In the HSC workflow, many of the asteroids look streaked or ‘bean shaped’ compared to the stationary background stars. This is due to the asteroid’s motion. The HSC observations are close to 150 seconds, and in that amount of time some asteroid orbits have on-sky velocities that move a noticeable number of pixels elongating the asteroid’s appearance in the image. But there are other ways to indirectly probe the shape of the asteroid. You can use the varying amount of light reflected by the asteroid over time to estimate the shape of the asteroid and how it rotates. Asteroids don’t produce their own light source. In the optical wavelengths (what our eyes can see), asteroids are reflecting a portion of the Sun’s light. How much surface area and the type of surface changes the amount of sunlight reflected back to the Earth. If the object is very round, you’ll see a nearly uniform amount of light from the object. If the asteroid is oblong, you’ll see the object brighter when the longer axis is facing Earth and a see it is fainter when the smaller axis as the body rotates. This picture can be complicated if there is compositional differences on the asteroid’s surface and how much light those different surface types absorb and reflect sunlight. I high recommend checking out Pedro Lacerda’s light curves of small solar system bodies website to see simulated light curves (brightness measurements over time) of small solar system bodies.